"This is a dish my mother used to make when I was a kid. It's great and when I made this for my ex-wife, she fell in love with it... and it's requested all the time." Bring water and rice to a boil in a saucepan. Reduce heat to medium-low, cover, and simmer until rice is tender and liquid has been absorbed, 20 to 25 minutes. Place bacon in a large skillet and cook over medium-high heat, turning occasionally, until evenly browned, about 10 minutes. Drain bacon slices on paper towels. Crumble bacon into small pieces. Heat oil in a skillet over medium heat; cook and stir eggs until set, about 5 minutes. Season scrambled eggs with salt and pepper. 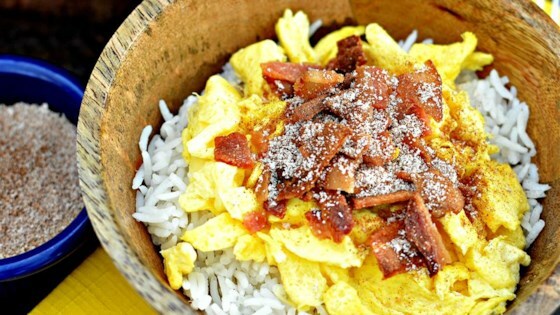 Layer rice, eggs, and bacon in a bowl; top generously with cinnamon sugar. You can buy pre-made cinnamon sugar or make your own: 1 part cinnamon to 3 parts white sugar. As strange as this might sound or look it's actually quite good. It was great especially after I added some quinoa and a tablespoon of maple syrup.